A popular wrestler’s recent match ended in tears as she snapped her leg in half after a stunt went horribly wrong. Mexican Lucha Libre star Goya Kong was attempting to wipe out her three opponents during a bout at the AAA Worldwide shows at the Juan de la Barrera Olympic Gymnasium in Mexico. Deciding to front-flip off the top rope of the ring onto the trio, Kong landed rather badly twisting her leg into a gruesome angle snapping it in half during the process. Crying out in agony the 30-year-old was immediately rushed to hospital where she has undergone surgery. It is expected that she will have to face six to 12 months out of the sport to allow her body to heal. 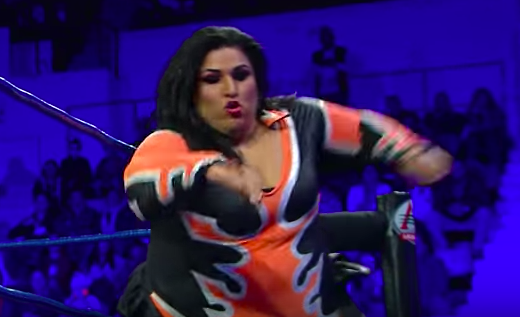 Daughter of Mexican wrestling legend Brazo de Plata, at least Kong did manage to take out her opponents even if it wasn’t in the way she expected or wanted. Kong is keeping in good spirits though posting regular updates for her fans from her hospital bed on Instagram. Long wait… In a few hours to operation, my God guides the hands of my doctor! We love to make you like a warrior! Today more than ever I want to thank my company for all the nice attention and the support they are giving me!! I have a fracture of the tibia and fibula but nothing stops me. I will return stronger than ever! Thank you all for your beautiful messages. I love you all. Hoy más q nunca quiero agradecerle a mi empresa por todas las atenciones tan lindas y el apoyo q me estan brindando!! Yyyy q decian ya se petatio está morra muajajajjaa pues noup!! Fractura de tibia y peroné pero nada me detiene regresaré más fuerte q nunca !!! Gracias a todos por sus msj tan lindos los amoooooo!!! Kong is clearly optimistic though, despite her horrific injury and being unable to even stand on her leg. Despite being a hard injury I feel very motivated to get ahead. I know I’m going through a stumble, but God sends his best warriors to the toughest battles. I cannot support my leg, but I can walk in a walker; I do not require absolute rest, according to the indications of the doctor I must have some mobility since that will help me to recover faster and without the generation of clots. It is yet another reminder that some sports can be particularly dangerous. Only yesterday a photo of a Muay Thai boxer with a gruesome head injury was shared on Facebook. 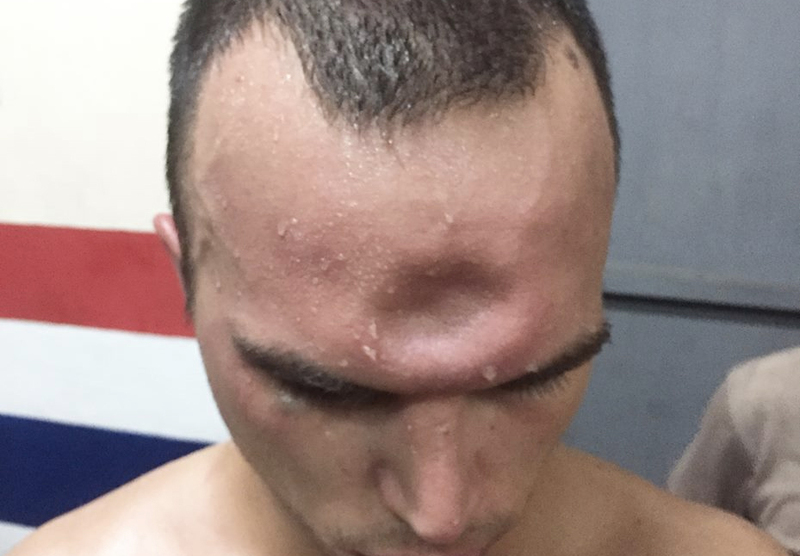 The French fighter known only as Jeremy took a rather lethal elbow to the forehead which left a rather nasty dent during a fight at the Sainamyen Stadium Patong, in Thailand. Despite his injury, Jeremy did not throw the towel in and wanted to keep on fighting until the very end. It was only after the referee assessed his injuries and called off the match that Jeremy went to hospital. We wish Kong and Jeremy the very best with their recoveries.